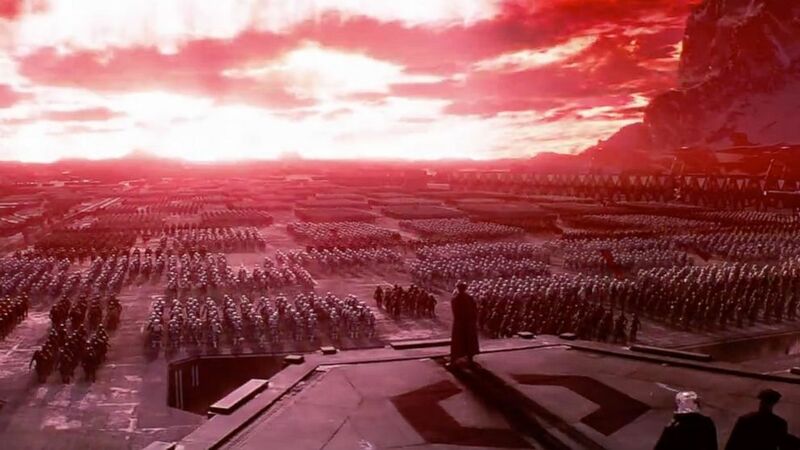 When it was announced to the world that the director of the seventh Star Wars movie, The Force Awakens, would be J.J. Abrams, it made the most sense of anyone imaginable. The task of continuing arguably the most beloved film saga of all time — while also redeeming the collective disappointment of “the prequels” — was a fool’s errand, after all. Of course, so was rebooting Star Trek in 2009, which Abrams handled with such deft aplomb that it resurrected the entire franchise. Abrams showed the perfect flair for paying respect to a series’ roots (which a new Star Wars movie is required, by nature, to do) while also being unafraid to take bold chances (which the three most recent Star Wars movies largely failed to do). Perhaps most anticipated about The Force Awakens has not been what the exact plot would be or how new and old characters would intertwine but how well Abrams would do with the torch that Disney passed on, after George Lucas finally released his grip. The world can now release its collective breath. J.J. Abrams’ hugely successful rescue of the series represents the truest new hope for the saga since 1977 — and in more literal ways than you may expect. So much of the focus leading up to The Force Awakens’ release was about the return of original cast members Mark Hamill, Harrison Ford, and Carrie Fisher, playing Luke, Han, and Leia three decades since we last saw them partying with Ewoks. There was discussion about the new crop of characters played by rising stars John Boyega, Daisy Ridley, and Oscar Isaac, as well as Internet fervour over the new villain’s lightsaber, but Abrams and his team had remained tight-lipped about the plot of the movie until recently. What’s interesting is that despite it being quite literally labelled the seventh episode of the series, it’s also an incredibly sly reboot of 1977’s A New Hope. In fact, one could go so far as to call it an out-and-out remake of the original classic. And yet, due to Abrams’ ingenuity and bold creativity, there are some — some, mind you — things that are actually even better done here than they were 38 years ago. Rey (Ridley) lives on a desert planet, scraping by as she waits for her life to begin. 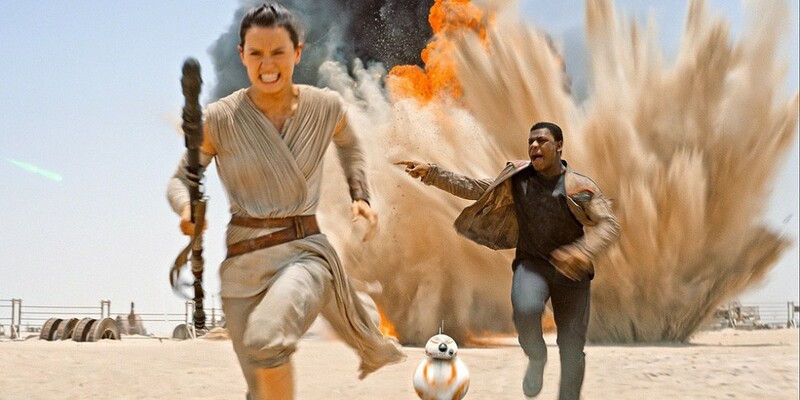 She soon finds herself on an interplanetary journey with the cocksure Finn (Boyega), with the mission of returning a secret map hidden within a droid. This time, though, the wise old man who guides them along the way and introduces them to the Force isn’t Obi-Wan Kenobi — it’s Han Solo. Meanwhile, the masked villain Kylo Ren (Adam Driver) — whose backstory promises to be more interesting than Darth Vader’s himself — rules over Starkiller Base (so called only because the more appropriately upsized moniker Death Planet was probably too on-the-nose), a world-destroying weapon used as the ruling hammer of the evil First Order. Abrams’ shrewdness never fails to impress, and in retrospect, he figured out the only way to crack a sequel that seemed doomed to let people down. By adhering to the formula and path laid out in the first Star Wars movie, he keeps enough familiarity that you instinctively warm up to it. Combined with the fact he’s not afraid to make bold, unpopular changes to established canon — this is the man who destroyed the planet Vulcan in his Star Trek reboot, after all — it’s the perfect mix of old and new. The story isn’t original, but neither was Return of the Jedi‘s. And let’s not give Lucas more than he’s due; it’s not like A New Hope was the first repackaging of Joseph Campbell’s monomyth for new audiences, anyway. That monomythic template has an undeniably strong track record. (If you don’t know what Campbell’s monomyth is, a quick search on Wikipedia will tell you all you need to know.) But what was so fresh in the retellings within A New Hope, Harry Potter and the Philosopher’s Stone, and The Lord of the Rings: The Fellowship of the Ring can’t help but feel just a little reheated at times here. Parallels are inherent when following the monomyth, but there’s enough difference between each of those series to make them feel distinct; when playing out in the same universe as A New Hope, using the same props, familiar costumes, and similar locations, it just can’t quite work as well overall. That said, there are definitely high points, largely among them being the actors. The old cast, particularly Ford, is wonderful. Everyone is clearly having fun and enjoying stepping back into the shoes that launched their careers. The next generation is just as excellent. Ridley has the effervescence of a young Keira Knightley, with a personal strength lacking in many young female action protagonists these days. 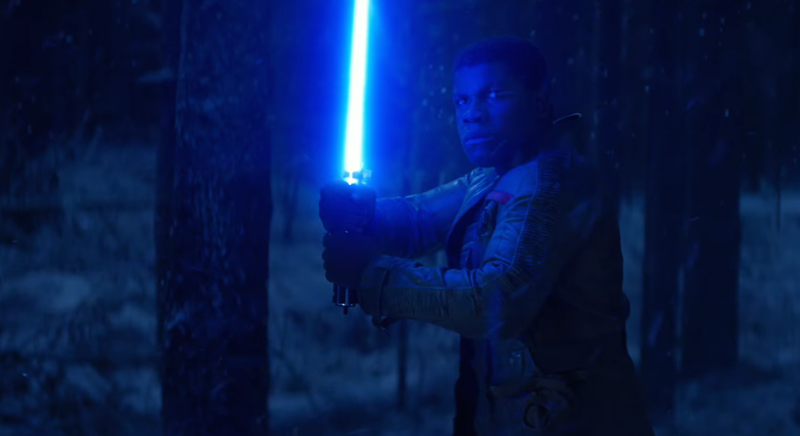 Boyega steals much of the movie, plus provides a lot of its humour. Isaac isn’t given as much screen time as pilot Poe Dameron, but does a fantastic job with the scenes he has. As with any Abrams movie, the action sequences are top-notch, and them are tons of them here. The best thing about The Force Awakens, though, is Adam Driver’s Kylo Ren. Driver has consistently stolen movies like Inside Llewyn Davis, The F Word, and This is Where I Leave You out from their lead actors, and he’s given a true chance to shine here. Ren is a brilliant villain, combining the unstoppable menace of Vader with the emotional tempestuousness of the prequels’ Anakin, resulting in — blasphemy alert! — what looks to be the greatest antagonist the saga has produced. Sequels will tell. Now that Disney owns Star Wars, the series is going to become more prolific and omnipresent, with at least four new movies set in Lucas’ galaxy far, far away coming out over the next four or five years. With the inevitability of that, the best that can be hoped for is quality. Thankfully, Disney has applied the same smart touch to Lucasfilm’s series they have to the stables of Pixar, Marvel, and The Muppets.